Ever wonder what a day with The Mountaineers Mountain Workshop might be like? Or how it all started? Learn more about this program that brings the outdoors to those who normally wouldn't have the resources to enjoy it. “You guys got me, right?” A student shouts down to her classmates, who are belaying her 50 feet into the air at Camp Long’s high ropes course. Her English is heavily accented, marking her Somalian roots, and the reply she gets from the ground comes from a native Spanish speaker, "Go, climb! You can make it!" 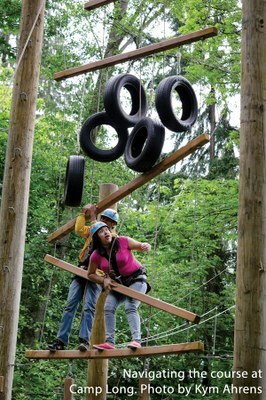 One by one, about 20 young people between the ages of 18 and 21 haul themselves up swinging timbers and ropes to stand high above us amid towering trees on a damp day in late spring. As each young adult reaches the top, I find myself cheering along with the ropes course leaders and the students’ translators as they climb over tires and logs suspended in midair. My voice blends into the group’s overall roar and a clamor of Khmer, Somalian, Spanish, Vietnamese and English encouragement fills the air. After they are lowered back down to the ground, the students from Seattle’s Interagency High School are ecstatic. This has been the hardest achievement yet over the several months they have been participating in The Mountaineer’s Mountain Workshops program, which exposes youth to outdoor recreation and conservation principles. Despite speaking various levels of English and other languages, this inspiring group of young adults works together as a team. To help each other reach the top, they use skills newly learned from The Mountaineers. In addition to learning how to rock climb and belay, they have also been educated on outdoor safety and Leave No Trace practices. Enjoying the wilderness is in some ways one of the most accessible American pastimes, yet there is an undeniable lack of diversity in many outdoor organizations. By focusing energy, volunteer hours and resources on providing outdoor experiences to underserved and diverse youth, however, Mountain Workshops are working to change this. Because The Mountaineers has stepped in, activities like climbing, hiking and snow sports are now relevant, accessible and interesting to kids like these from this Interagency High School Group. “Many of these students are new to the United States,” says Ryan Patek, a truancy officer at Interagency High School who monitors and encourages these students’ attendance. His goal is to keep them in school and motivated to succeed. At their international high school, they develop the skills that are necessary to succeed in their new American lives. They are older than most high school students (all over 18), but because of language and culture barriers, needed a little extra time to finish up. Mountain Workshops complement and further enrich their education. In addition to learning valuable life skills, the diverse group of young adults has the unmistakable energy of kids having fun in the outdoors. They laugh and jostle each other, and while some are more withdrawn than others, there are a few who aren’t shy to strike up a conversation. 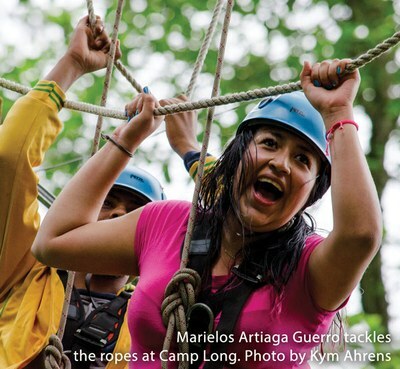 Another young woman, Marielos Artiaga Guerrero (pictured to the right), more nervously approaches the ropes course. As she struggles to reach to the top, her translator switches from Spanish to English to let the rest of the group know, “I know her, she can do this. She is good.” Sure enough, the shy and quiet Latina makes it all the way up. And then there is the exuberant and youthful Osman Hassan, who has a huge grin on his face throughout the whole morning. “You should try it, it’s so fun!” he exclaims after his climb. When I asked him if he had ever done something like this before, he continues to smile as he said, “You know the Pyramids? In Egypt? That was the biggest thing I have climbed.” Washington State might not have pyramids, but his appetite for adventure just might make him a Mountaineer for life. 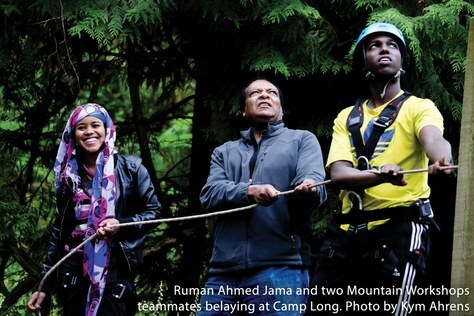 Ruman, Marielos and Osman are just three of the participents in this program who approach these seemingly impossible tasks with courage and perseverance. Meanwhile, they're learning the cerebral and abstract concepts that come with familiarizing oneself with a whole new language and culture. Mountain Workshops provide a safe space for them to conquer physical and tangible obstacles, in natural surroundings they would otherwise not have access to. The Mountain Workshops program grew out of a desire to provide just that: access to the outdoors for those who normally wouldn't have the resources. Starting in 2010, funding for the first Mountain Workshops session was spearheaded by Mountaineers climb leader, board member and donor, Leah Schulz. She saw how the resources this organization has could impact the lives of kids and young adults — propelling its conservation and stewardship principles into the future and across barriers of diversity. This article originally appeared in our July/August 2014 issue of Mountaineer magazine. To view the original article in magazine form and read more stories from our publication, click here.